Purpose: To investigate the efficacy of various formulations of chlorhexidine 0.2% (CHX) in terms of plaque and gingival bleeding control compared to each other and to saline rinse (CTRL) over a 35-day rinsing period. Materials and Methods: Seventy subjects were randomly allocated to one of 4 groups rinsing twice daily for 35 days. The different groups used CHX 0.2% rinse with alcohol (CHX1) and without alcohol (CHX2), with an antidiscolouration system (CHX3) or saline rinse (CTRL). Clinical examinations to evaluate full-mouth plaque scores (FMPS) and periodontal parameters were performed at baseline, 7, 21 and 35 days. Tooth discolouration (TD) was measured at each time point using digital photographs and spectrophotometric analysis. Results: At 35 days, CTRL showed the highest levels of plaque. The mean changes in FMPS from baseline were 69.8% ± 6.8 for CHX1, 57.5% ± 9.8 for CHX2, 43.7% ± 9.8 for CHX3 and 25.8% ± 7.7 for CTRL. Statistically significant differences were demonstrated between CHX1 and CHX3 (p = 0.02), CHX2 vs CHX3 (p ≤ 0.05) and CHX1/CHX2 vs CHX3 (p < 0.05). In contrast, CHX3 appeared more effective in reducing inflammatory indexes. TD increased over time in 60% to 70% of participants, although lighter staining was found in the CHX3 group. Greater FMPS reduction was observed in participants with staining vs without staining (26.0% ± 12.3, p = 0.04). Conclusion: Conventional CHX appeared more effective in terms of plaque reduction. Interestingly, the newest formulation showed a higher control of gingival inflammation. Staining was associated with lower plaque levels. Sakalauskienė, Zana / Machiulskiene, Vita / Murtomaa, Heikki / Vehkalahti, Miira M.
Purpose: To assess factors related to satisfaction with dental care and its role in dental health-related behaviour among Lithuanian university employees. Materials and Methods: Our cross-sectional survey collected data on respondents' satisfaction with dental care using 24 statements. The self-administered questionnaire also inquired about dental attendance, dental health-related behaviour and attitudes, self-assessed dental status and background details. All 35- to 44-year-old employees (n = 862) of four universities in Lithuania were invited to participate; 64% (n = 553) responded, 78% of them were women. Statements on satisfaction with technical, personal and organisational dimensions of the dental surgery were assessed using a five-point scale, ranging from entirely agree to entirely disagree, with higher scores indicating stronger agreement. Overall satisfaction scores were summed and subjects divided into tertiles to evaluate dental health-related behaviour. For the logistic regression model, subjects were divided into two groups of satisfaction level (below and above the mean of the sum score). Results: Subjects were highly satisfied with dental care, with the mean sum score being 99.5 (SD = 12.62, range 59-120). 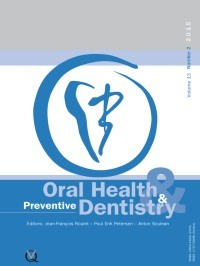 Stronger satisfaction was reported by those visiting private practices (p < 0.001) and the same dentist longer (p = 0.006) and by those who entirely agreed with the statements on dental health-related attitudes (p ≤ 0.001). The logistic regression model showed that higher satisfaction with dental care level was more likely for those who indicated check-up-based regular dental attendance (OR = 1.7) and brushing their teeth at least twice daily (OR = 1.6). Conclusions: Satisfaction with dental care is positively related to individuals' dental health-related attitudes and behaviour among highly-educated subjects in particular. Purpose: To characterise demographic and clinical parameters among individuals with dental anxiety and exaggerated gag reflex compared to a control group and to analyse the associations between the various parameters. Materials and Methods: Sixty-eight patients with dental anxiety and 54 patients with exaggerated gag reflex were compared to a control group of 200 individuals undergoing dental treatment. The collected data included demographic parameters, health status, smoking habits, Decayed, Missing and Filled Teeth (DMFT) and plaque index (PI) scores. Results: PI was significantly higher among patients with exaggerated gag reflex (1.91 ± 0.95) and dental anxiety patients (1.82 ± 0.89) compared to the control group (1.27 ± 0.74; P < 0.001). DMFT was significantly higher among patients with dental anxiety (13.64 ± 7.57) compared to patients with exaggerated gag reflex (10.52 ± 5.42; P = 0.033), and between both groups compared to the control group (4.09 ± 4.034; P < 0.001). Multivariate logistic regression analysis revealed that PI, DMFT and age were positively associated with exaggerated gag reflex and that DMFT and educational level were positively associated with dental anxiety compared to the control group. DMFT was the only significant parameter positively associated with dental anxiety compared to exaggerated gag reflex. Conclusion: DMFT and PI scores were higher among patients with dental anxiety and exaggerated gag reflex. Clinicians should consider additional oral hygiene measures and education, maintenance meetings and recall visits in those patients, as well as using supplementary aids, such as fluoride mouthwash and fluoride varnish applications, to maintain oral hygiene without triggering the exaggerated gag reflex. Petrou, Marina A. / Santamaria, Ruth M. / Romasew, Ausra / Splieth, Christian H.
Purpose: Children's Dental Passes (CDP) are widely used in Germany for documentation and motivation of oral health in children, but have not been evaluated at all. The purpose of this cross-sectional study was to analyse the distribution, use and acceptance of the CDP in Mecklenburg-Western Pomerania (MWP), Germany. Materials and Methods: Data were collected with a self-administered mail questionnaire sent to all registered dental offices in MWP. Results: The effective response rate to the survey was 18%, representing 21% of all dentists in the state. Almost all dentists (91%) considered the information contained in the CDP important. Additionally, 81% of dentists provided their patients with a CDP and 78% recorded the oral health status of their patients in it. 54% confirmed that the CDP's implementation has improved the consultation behaviour of young children's parents. 71% of dentists felt that the behaviour of their young patients during treatment has improved after the implementation of the CDP. Likewise, 61% of the respondents thought that oral health among children has improved after the introduction of the CDP. Conclusion: The CDP can be considered an important element for health promotion that offers a comprehensive approach to early prevention of oral health diseases of young children in Mecklenburg-Western Pomerania. Purpose: To assess malocclusion and related quality of life among 13- to 19-year-old students in Mysore City. Materials and Methods: A total of 900 students aged 13-19 years selected based on multistage stratified random sampling were included in this cross-sectional study. A pre-designed format was used to record the sociodemographic details, oral hygiene practices, personal habits, malocclusion and oral health related quality of life. Malocclusion was assessed using Dental Aesthetic Index (DAI ) and quality of life using Oral Health Impact Profile-14 (OHIP-14). Further, the association between malocclusion and related quality of life was assessed. Results: Normal or slight malocclusion was seen in 79.2% (n = 713). Definite malocclusion was seen in 12.8%, severe malocclusion in 5.7% and handicapping malocclusion in 2.3% of the subjects. The overall prevalence of malocclusion was found to be 20.8%. Out of the 900 study subjects 46.6% (n = 419) reported that malocclusion had some impact on their oral health related quality of life. The results of logistic regression demonstrated that those with malocclusion experienced a significant impact on quality of life (OR = 16.07, CI = 9.17-28.17). Conclusion: Malocclusion has an impact on the oral health related quality of life among 13- to 19-year-old students in Mysore City. Purpose: To evaluate the changes of Oral Health Related Quality of Life (OHRQoL) in patients after the placement of a fixed orthodontic appliance. Materials and Methods: This prospective study consisted of 148 adolescents (97 girls and 51 boys) between the ages of 14 and 17 who were patients of an orthodontic clinic. OHRQoL was assessed by a modified questionnaire that evaluated four domains: oral symptoms, functional limitations as well as emotional and social well-being in three time frames: before bonding and banding (T0), two months after initiating orthodontic treatment (T1) and six months after initiating orthodontic treatment (T2). The repeated measures test was used to compare the relative changes of OHRQoL among the different time frames. Results: There were no significant differences between the levels of OHRQoL and its domains for boys or girls at any time point. The overall level of OHRQoL decreased significantly at T1 relative to T0; however, the emotional well-being domain improved at T1 in comparison to T0. At T2, the OHRQoL level increased significantly relative to T0 in all domains. Conclusion: The patients' quality-of-life level decreased by initiating orthodontic treatment; however, during that period, emotional well-being increased. As orthodontic treatment progressed, the quality of life level increased. Purpose: To investigate the importance and range of tooth wear in deciduous teeth from the 14th century based on the examination of child skeletons from the Cedynia cemetery in Poland. As mechanical wear was widespread in early human populations, this study recorded symptoms of attrition and abrasion (facets and scoops), relating them to possible causative factors. Materials and Methods: The study material comprised 84 child skulls (458 teeth) categorised into two age groups: 1. up to 7 years; 2. from 8 to 14 years. The degree of tooth wear was determined on the basis of a modified Smith and Knight's classification. Significant differences between examined features were determined by the chi-square and Fisher Freeman Halton non-parametric tests with the significance level set al p < 0.05. Results: Statistically significant differences between age groups in the canines and molars were found (p < 0.05). More advanced wear of deciduous teeth was noticed in the older group. There was no difference in distribution of tooth wear between the maxilla and the mandible. Conclusion: Examination of children's dentition showed that wear of deciduous teeth rose with the age of individuals, which agrees with the referenced literature data. This study confirms the relationship between dietary patterns and tooth wear and corroborates a role of tooth wear in determining developmental age and growth of the masticatory system. Purpose: To evaluate the antibacterial effect of Kenger gum on mutans streptococci (in vivo) and Streptococcus mutans (in vitro) and its cytotoxic effect on the 3T3 fibroblast cell line. Materials and Methods: In vitro antibacterial activity of Kenger gum extracts against S.mutans was determined by the disk-diffusion method. The broth dilution method was used to determine the minimum inhibitory concentration (MIC). The cytotoxic effect on 3T3 fibroblast cells at different time intervals was determined using cell culture and viability assays. Clinical studies were then performed on 20 healthy adult subjects, where a sugar-free chewing gum was used as a control. To determine the MS counts, oral rinse samples were taken before chewing as well as 30 and 60 min after 15 min of chewing. Repeated-measures ANOVA was used to compare the bacteria level in the oral rinse samples between the two chewing gums. The Least Significant Difference test was used for adjustment for multiple comparisons. Results: The MIC of the acetone extract of Kenger gum was 30 μg/ml. The acetone extract of Kenger gum possessed moderate antiproliferative properties against the non-tumorigenic cell line 3T3. A statistically significant decrease was observed for both chewing gums at 30 and 60 min. The decrease continued at 60 min after chewing Kenger gum, while the values for control gum tended to approach the baseline after 60 min. Conclusion: This preliminary study showed that Kenger gum had particular and prolonged antibacterial activity against S. mutans and salivary mutans streptococci. Purpose: To evaluate how periodontitis patients perceive the outcome after long-term supportive therapy. Materials and Methods: 281 patients (150 women/131 men) with a mean age of 55 years (range: 45-86 years) were randomly selected and consecutively interviewed using a questionnaire designed for laypersons. All patients had shown high compliance with the recommended supportive periodontal therapy (SPT) for up to 16 years (mean observation period: 12.5 years). Statistical evaluation was performed using the 2-sided t-test. Results: A very high degree of confidence in the periodontal treatment (mean: 9.24, range 0-10) was found. Women noticed a higher positive impact on their social environment (P < 0.05). Patients who underwent SPT < 3 years showed a higher positive perception of treatment success than patients with SPT > 3 years (P < 0.01) and reported a greater impact on appearance (P < 0.01). Regenerative treatment demonstrated advantages over resective open flap debridement (OFD) procedures (P < 0.05) and scaling and root planing (SRP) (P < 0.05). However, treatment costs (P < 0.001) and time required (P < 0.01) for regenerative procedures were perceived as a burden. Periodontal treatment by a specialised team led to a significant reduction in the patients' complaints (P < 0.01). The SPT interval did not influence patients' perception of treatment success. Conclusions: Systematic periodontal therapy with subsequent SPT met the patients' demand to preserve oral health. Regenerative procedures prompt the perception in patients of better remission of periodontitis symptoms. Further trials should investigate clinical results of periodontal therapy regarding patient expectations. Purpose: To verify the presence of Socransky Red Complex (Porphyromonas gingivalis, Treponema denticola and Tannerella forsythia) and P. intermedia using polymerase chain reaction (PCR) in periodontally healthy pregnant women and pregnant women with periodontal disease, as well as its relation to arterial blood pressure and capillary glycaemia. Materials and Methods: This case control study included 86 pregnant women, including 50 pregnant women with healthy periodontium, 27 with gingivitis and 9 with periodontitis. Arterial blood pressure and glycaemia were evaluated and recorded. Clinical specimens from the gingival crevice or periodontal pockets were gathered with sterile absorbent paper cones. DNA extraction was accomplished using the Easy-DNA Kit test and the presence of bacteria was detected by PCR with primers and specific probes for each microorganism. Results: The arterial pressure of all pregnant women was found to be within normal levels and 51% presented with hyperglycaemia, these two variables were not associated with periodontal conditions and/or presence of microorganisms. Socransky Red Complex was not present in pregnant women with healthy periodontium; however, it was present in pregnant women with gingivitis (3.7%) and in a higher percentage of pregnant women with periodontitis (33.3%). Conclusion: Socransky Red Complex was found only in cases of periodontal diseases and is not related to blood pressure and/or high levels of blood glucose. Purpose: To investigate the possibility of influencing adolescents' caries incidence, knowledge and attitudes to oral health and tobacco through a school-based oral health intervention programme. Materials and Methods: Four schools in a county in Sweden were randomised to one intervention and one control group. At the intervention schools, two dental hygienists worked 4 h every week for two years. Health education and preventive measures, such as fluoride varnish treatments every 6 months, were performed. The control group had no intervention. The study included a total of 534 participants aged 12-16 years. Outcome variables of the study were 1) caries incidence assessed on bite-wing radiographs and 2) knowledge and attitudes measured through questionnaires. Results: The intervention programme impacted on the incidence of enamel caries, while no effect on dentin caries could be seen. Data from the questionnaires showed that the adolescents considered their teeth as important. Adolescents in the intervention group had better knowledge about oral health and oral hygiene compared to the control group after the two years, but no impact on attitudes toward tobacco could be seen. A majority of the adolescents were positive to the education about oral health and tobacco and they believed that the dental hygienists would help them improve their oral health. Conclusions: Although the effects of the intervention as regards to caries incidence, knowledge and attitudes were limited, the presence of dental hygienists in school was appreciated by the adolescents and seemed to increase their interest in their oral health.